As I get older I find that organising a night out with friends is becoming more and more difficult. We no longer have the time that we once had. Children, work and other commitments invariably get in the way. So I was lucky to spend an evening last weekend with some of my favourite people. After a long and somewhat bizarre WhatsApp group chat we eventually settled on a date and a cuisine that we fancied. Our faithful group leader booked a table at Sant Yago in Southsea, which is on the south coast on Portsea Island. Sant Yago is a tapas restaurant and cocktail bar, located in one of the trendier areas of Southsea. I love tapas, and having spent several years visiting family in Spain, I am quite comfortable with Spanish food and generally know what to avoid. Regardless, I also like to forewarn an establishment that feeding me can be a challenge, so I decided to contact Sant Yago well in advance of our visit. I sent a message explaining my many allergies and asked if they had an allergy menu that they could send me. And that was that. I heard nothing more and then forgot to chase up a reply. On the day, my friends asked if I’d managed to speak to the restaurant about my allergies, and when I told them I’d not had a reply we all thought the restaurant had not seen my message. When we got to the restaurant we were welcomed to our table and while we were ordering drinks, the server asked who in the party had the allergies. I was gobsmacked. They had seen my message after all. Not only that, they’d written me a list of everything on the menu that I could have. Double gobsmacked! The list was extremely helpful, but I was surprised that dishes were missing that I would expect to be ok. Bread, for example. Also, there was no chorizo on the list, which in my view is a staple tapas ingredient and Mr Allergy and I virtually live on it at home. The slow cooked rib meat was also missing from my special menu, which was rather disappointing as it sounded amazing. The other disappointing thing was that the menu advertised on the website was not the menu being offered in the restaurant. Some dishes were still offered, but others had been swapped for new dishes. This meant no chorizo in pear cider, braised pig cheeks or venison stew. I’d particularly been looking forward to the chorizo in pear cider as I’d eaten it here once before and it was divine. I spoke to the server about my list and questioned why some things were missing. The rib meat and chorizo and chicken skewers apparently contained dairy. Now I know that some chorizo recipes do contain a bit of milk, but on the whole it’s such a small amount that it wouldn’t hurt. The bread was bought in, so they couldn’t guarantee it didn’t contain nuts. I said that as long as nuts aren’t part of the recipe, I’m happy to eat it (otherwise I’d have to avoid most foods made in a factory or environment where there might be nuts), but they were really nervous and not willing to let me try. I’m pleased that they took my allergies seriously, as many establishments don’t, and I understand that they have to manage their risks as they see fit. The last thing they would want is to serve someone potentially fatal food. But when an item on a menu may contain an allergen because of the environment where it is made, and not because it is in the recipe, I think the choice should rest with the diner. I also wondered if one of the dishes ought to have been on my list. The steak skewer says it is served with pesto, which usually contains nuts and dairy. There was another steak dish that I wanted to try, so I didn’t ask about the skewers, but I can only imagine they wouldn’t have served the pesto. I chose the pork crackling, sweet potato stack, potatoes in tomato sauce, bavette steak and pork belly from my list to share with Mr Allergy. He also ordered the slow cooked rib meat, chicken and chorizo skewers and mixed bread for himself. When my dishes came out, they had been specially prepared, which is very reassuring. I have to admit that I was a bit naughty and tried a bit of Mr Allergy’s bread with balsamic vinegar dip. It was a risk I was happy to take, and I was armed with two epipens which my Navy medic friend was prepared to use. For a quick and easy, tasty lunch, try grilling a block of Violife Mediterranean Style Block (a dairy free Vegan halloumi substitute). Cut the block in half, season with salt and pepper and serve in a toasted pitta with hummus, falafel and a handful of mixed salad leaves. Yummers! I went for a curry this evening…..or so I thought. Here’s the story of what happened when I got there. A group of us were going to belatedly celebrate the new year, and we chose an Indian Restaurant where I’ve eaten many times before and they’ve been really good with my allergies. When the waiter finally came around, after about an hour of waiting, I gave my order for starter and asked to speak to him about the main because of my allergies. I normally have the lamb lahorei but fancied trying something different. To my astonishment he replied that because I’m allergic to dairy I couldn’t have any curry from the menu as every single one has milk in the sauce base. I argued my very valid point that I’ve eaten there many times before, and even have written correspondence from the restaurant saying which dishes are suitable. The only thing they could offer was a dry vegetable dish. This provoked a reaction in me that hasn’t arisen for quite some time, and I’m not proud of it. I was hungry and just wanted to be able eat a nice meal with no problem. So I simply got up, took my coat and bag and left. I hate it when situations bring this reaction out in me, but I just don’t know what to do. It’s a mixture of frustration, disappointment and shame that once again I’m feeling victimised for having an allergy. So I leave. I usually come back, feeling slightly sheepish and wondering what was said while I was gone. This evening I walked out of the door not really sure where I would go. I didn’t really want to get in the car and drive home as I’d miss out on the conversation and fun of a night out with the group. So I did something I’ve never done before. I went into the Indian restaurant next door to see if they could do me a take away (which I thought I could take back into the original restaurant and eat)!! It turns out they couldn’t cater for me either, which really baffles me. I’ve been eating Indian food for 20+ years and I’ve never before experienced an entire menu that I’m allergic to, never mind two menus! I went back in to the original restaurant and they agreed to make my starter a large portion, so I could have it as a main. It was ok, but not what I wanted. The restaurant clearly understands about allergies as the waiter knew the difference between allergies, intolerances and people who just don’t like something, so I just don’t get why they do not offer allergy friendly options, particularly when they previously did. I am being discriminated against for being born differently to normal people, and I don’t think this is right. It put a complete downer on my night and that of the people I was with, when it could have been easily resolved. Don’t put the milk in it. Simple. I feel I should mention the name of the restaurants so other allergy sufferers in the Portsmouth area don’t get caught out. The restaurant we ate at is Massala Room. Interestingly, one of the reviews on their website mentions how well they catered for the reviewer’s Vegan niece. How did they manage this, then, if all the sauces have milk in them? The restaurant next door is Indian Cottage. I can safely say I won’t be going back any time soon. After all, what’s the point? Whilst staying with my in-laws in the Catalonian resort of Pineda de Mar for IRONMAN Barcelona (not competing, I’d like to add), we were spoilt for choice on where to fuel up. Staying at the Aquahotel we were pretty close to the centre of Pineda, the beach front and a 25 minute walk or short train ride from Calella. On our first night in the area, Trip Advisor recommended Ca L’Aureli, a tapas restaurant two doors down from the hotel, so we wandered down to find it really busy. We carried on a little further past a few bars and shops until reaching the main precinct. Part way along I noticed a name that I recognised from my Trip Advisor research, so we thought we’d give it a go. The entry to the restaurant is understated, and we were happily surprised to be taken through to the covered courtyard garden at the rear of the restaurant. It’s simply beautiful. Can Josep, named after the owner’s father, is a family restaurant through and through. We were served by the restaurant owner, who proudly pointed out the retro black and white photographs of her parents that have been printed onto the doors to the ladies and gents bathrooms. The menu was available in English, and consisted mainly of grilled meats and fish. Black paella is apparently the star dish, but of course this is no good for my fish allergy. Although the menu doesn’t state the allergens present in each dish, the owner was able to discuss my requirements in detail and I settled on trying the grilled rabbit which was served with grilled aubergines and courgettes. I had been expecting some potatoes, but these didn’t arrive, which wasn’t a problem as there was plenty of food on my plate. This was my first time eating rabbit, and it was delicious, although rather fiddly to eat from the bone. Mr Allergy and Allergy Mum-in-Law has the pork loin, whilst Allergy Dad-in-Law went for the cod. All of the meals were simple but beautifully executed. The grilled meats fitted well with Mr Allergy’s IRONMAN fuelling strategy, and of course I was well catered for. 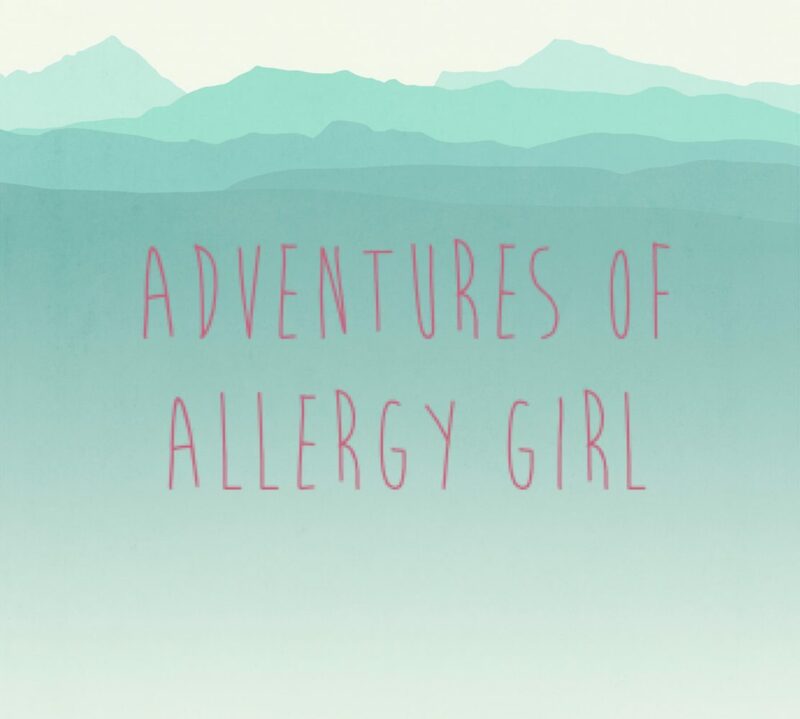 I would definitely recommend this restaurant for allergy sufferers and normals alike.